In your military career, it is often beneficial to put down the FMs or technical reading and take a look at your history books. Our Army is only the best in the world because of the people within its ranks. Examining the leaders of the past can benefit us as current leaders, and provide us with an example to emulate. Let’s take a look at my picks for the top 5 Generals of WWI and see if there isn’t one that perhaps you could strive to become. 5. General Mason Patrick: This man was a huge advocate for air power and one smart man. Born in West Virginia, he was a West Point Graduate and continued on to study engineering. During World War I he was the Chief Engineer for Lines of Communication. He was also Director of Construction and Forestry of the American Expeditionary Forces (AEF) as a BG. Appointed by Gen. John Pershing, he was in command of the Combined Air Services of the AEF. After the war, he returned to the US and continued to be an engineer finally becoming Assistant Chief of Engineers. As a fellow Engineer, I find General Mason Patrick to be a good role model. 4. General Frank Parker: Major General Frank Parker, a native of South Carolina, graduated from the United States Military Academy in 1894. His career spans from the Spanish-American war through WWI. Most notably for me as an Armor Officer, he was as an instructor and organizer of the Cavalry in Cuba. When the United States entered World War I, he was assigned as commander of the 1st Division of the American Expeditionary Forces, and chief American officer at French headquarters during the war. He continued to serve after the war up and through WWII as the assistant chief of staff of the army, as commander of the 6th Corps, of the 2nd Army, and of the Philippines Department. After his retirement in 1936, he was the director of the Illinois War Council during World War II. 3. General Tasker H. Bliss: Born in 1853, this man devoted his entire life to the service of his country. Gen. Bliss served from pre Spanish American War up through the end of WWI. Early on, he served by studying the military tactics of foreign nations (Germany, France, Great Britain and then served as an Aide-de-Camp. Over the remaining years he held many prestigious positions and was appointed by Congress (with the influence of Theodore Roosevelt) as a member of the General Staff of the US Army. During WWI he was assigned as the American Permanent Military Representative, Supreme War Council, concurrent with the U.S. Army Chief of Staff position. Gen. Bliss is an excellent example of leadership and career advancement. Plus, he was from Pennsylvania which makes him all the more respectable. 2. General Douglas MacArthur: Gen. MacArthur is generally noted for his success during WWII. However, Gen. MacArthur made Brigadier General during WWI where he was nominated multiple times for the Medal of Honor and was highly decorated for his accomplishments. He was also the youngest man to make the rank of Major General. Looking into his past, Gen. MacArthur was a flawless example of a Soldier and leader. On top of graduating on top of every class he was in, he was a part of a long military family tradition. While it may be impossible to reach the heights of his success, Gen. MacArthur is an amazing example of a superb Army Officer. 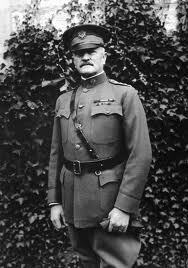 Famous WW1 General John Pershing! 1. General John Pershing: This choice was obvious as Gen. John Pershing is the only person to be promoted in his own lifetime to the highest rank ever held in the United States Army—General of the Armies. Serving from the days of Pancho Villa through WWI, this man saw it all. President Roosevelt took great interest in Pershing’s leadership abilities which caused him to petition to the Army General Staff to promote him (of course he was not promoted as promotions were based off seniority rather than merit). Roosevelt was successful in persuading Congress to promote Pershing to Brigadier General. His career and successes are far too many to discuss in this simple post, but Gen. Pershing was the greatest General of WWI. The way I see it, any man who advises the likes of Eisenhower, Bradley, Douglas and George Patton deserves the utmost respect. FINAL THOUGHTS: This is just my ranking. What do you think? Who are your favorites Generals of WWI? Leave your comments below; thank you. In my hometown of Kansas City, Missouri, there is a massive memorial to Gen. Pershing just across from historic Union Station downtown. It consists of several life-size sculptures, plaques, and various historic markers. The area is known as Pershing Square and is still a central meeting place for locals as well as a big tourist spot, as can be expected. That corner in Kansas City is a two-for-one if you are a tourist, since Pershing Square is directly across the street from where the famous Union Station Massacre took place, which involved big-time criminals Pretty Boy Floyd and Machine Gun Kelley. Lots to see in KC. The next time I travel out west, I will have to stop in Kansas City and see the Pershing Square. It sounds like a great tourist attraction. This is a great list of WW1 Military Generals, Justin. Up until I read your list, I had never heard of General Mason Patrick or General Frank Parker. These guys really accomplished some amazing things! The other generals on the list are more well known. I agree with you that General Pershing was a brilliant tactician and leader. And I never knew that General McArthur was nominated for the Congressional Medal of Honor several times. MacArthur certainly didn’t deserve the one he got. He should have received a court martial instead and I’ve heard that he thought he might get one. But the US needed heroes so instead he got an MOH and a fifth star. That cost the lives of thousands of US soldiers.